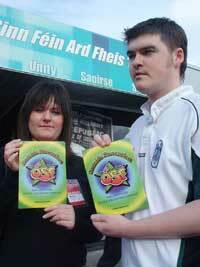 At their National Congress in Dublin this afternoon, Ógra Shinn Féin launced a nationwide suicide prevention campaign. This campaign will focus on the dissemination of information and the demand for an all Ireland approach to suicide awareness. It will also lobby the Irish and British governments to ensure that suicide prevention receives the priority, the funding and resources it requires. “People taking their own lives or attempting to take their own lives is a major social issue on the island of Ireland. It is estimated internationally that 1 million people take their own lives every year. Ireland has the second highest suicide rate in Europe, this rate has increased by more than 25% over the last decade. Suicide is the biggest killer of young people in Ireland therefore it is imperative that Ógra begin campaigning and disseminating information on this issue. “There were 577 reported deaths by suicide in the year 2003-2004, a greater death toll than the number of people killed in road traffic accidents over the same time period and although statistics are strikingly high amongst young men, suicide transcends class, gender, and age, ethnic or religious background. It is suggested that the death toll from suicide over the last 35 years may be even greater than the number of people killed as a result of the political conflict. “Ógra Shinn Féin’s campaign will focus on the dissemination of information and the demand for an all Ireland approach to suicide awareness. It will also lobby the Irish and British governments to ensure that suicide prevention receives the priority, the funding and resources it requires. Speaking at the Congress Sinn Féin President Gerry Adams MP commended their campaign on suicide awareness and prevention. The Sinn Fein leader also revealed that the Minister of Health Mary Harney has yet to formally reply to repeated requests from him to meet on the issue of suicide prevention. “Ireland has the second highest incidence of suicide in Europe. That is a startling and depressing statistic which disguises the human cost in lives lost and of families bereaved and left grieving. It is the biggest killer of young people in our country. That makes suicide a national disaster. Our country urgently needs a national plan to address this crisis. In the 26 Counties the government established a Suicide Task Force some years ago which has seen welcome progress being made. In the north we need a regional plan for suicide prevention. But the issue of suicide also needs to be tackled on an all-Ireland basis. Specifically it should be made an area of co-operation under the auspices of the North-South Ministerial Council. In that context I welcome meetings between the Health Minister Mary Harney and the British Health Minister Shaun Woodward. However, I have yet to receive a formal response from the Minister of Health Mary Harney to repeated requests from me for a meeting to discuss this issue. I first asked for a meeting with her in May of last year and my office has been in regular contact with Ms Harney’s officials since then. Concern about suicide is greatest in local communities. Alongside the anguish of bereavement, there is a growing sense of burn-out. Families do not receive the support they need to cope with the strain of someone who is feeling suicidal, or with the aftermath of someone who takes his or her own life. Many other parents carry a sense of dread, worrying about the fate of their own children. Nice to see someone on the left take this up. Its an epidemic and I believe root causes are directly linked to our system of exploitation, oppression, and marginalisation. Amomg People most likely to commit suicide are long term unemployed, prisoners, homeless people and young gays. Utterly depressing article from a Socialist mecanistic approach, little to do with humanity. Is this all the SWP can offer and what makes this man think hes qualified to write on the subject? All the best in the Campaign.